Some time ago I discovered Debbie Lyddon’s Marshscape Collage series on Pinterest. Since then I have often returned to look at Lyddon’s website and blog. I have used fabric as collage in encaustic painting but now I was thinking textile art first. I began looking for a new way to bring together textiles and encaustic wax painting. Encaustiflex is a new microfiber material, a rip-proof, paper-like product branded by Leslie Giuliani specifically for Encaustic monotypes. Encaustiflex is made of spun polyester and nylon using recycled soda bottles. Encaustiflex makes it possible for an artist to hand or machine sew their encaustic paintings!!! Thanks to Leslie for sending me a free sample to review here and for developing this product. I am so excited to introduce Encaustiflex to you. This is the exact process I used to make the landscape painting above. I began by painting with Enkaustikos Hot Sticks and Encaustic Art Wax Blocks on an anodized aluminum plate on top of my griddle. To pull a monotype print from the plate, I place a cut sheet of Encaustiflex on top of the plate gently pressing it down with my fingertips, then I rubbed the entire surface with a baren. 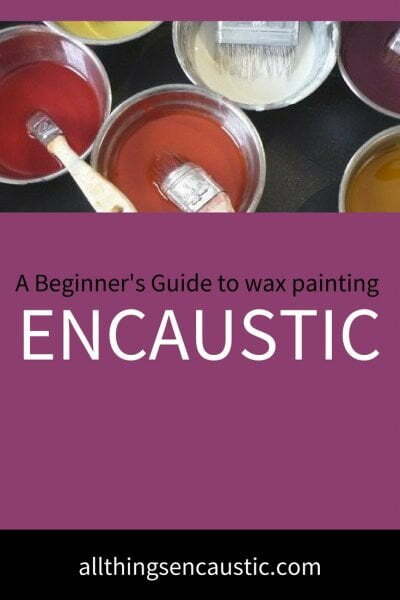 (read more here about encaustic printmaking). Next, I added a scrap of blue fabric onto the monoprint. I stitched with blue thread directly onto the encaustic print using the sewing machine. Yay Encaustiflex! A strip of a gorgeous golden silk fabric was then added. Before sewing it in place, I gently frayed the edges to bring out red threads and yellow strands. One of my favourite things about this painting is the thick rough line of white thread that I stitched across the horizon of the sky. When I pulled monotypes in the past I didn’t own an encaustic stylus. The stylus was fabulous for adding more detail to the print. Finally, I added a second scrap of blue fabric by machine. I wasn’t sure how I would mount or frame the finished piece. And although some of the texture is lost, in the end, I did put it in a frame behind glass. You can purchase Encaustiflex here and a complete printmaking kit here. Then please come back and add a comment below to let me know what you think of it. Hi Ruth. Thanks so much for this post on encaustiflex. Question: How did you manage to sew through wax with your sewing machine without gunking up the machine?? Thanks in advance! I was worried about this myself but the monotype layer of wax was so thin that it wasn’t a problem. I came back in with the encaustic stylus and added thicker wax on top. Where can I find it and buy it?